Where young and old come to study and explore the richness of their heritage. Where people come to help or be helped. Where people care. And smile. And live life to the fullest. Introducing the Chabad of Naples Jewish Community Center. When we began back in 2004, we ran our activities out of our house. The community responded in such an overwhelmingly positive way that in a very short span of time, we were renting space for our Center. After another short period of time and to meet the needs of the community, we expanded by renting a second location and operating out of two different locations. We are blessed, fortunate and proud to say that we outgrew all of our facilities in our service to the Jewish Community of Naples and Marco. Chabad Naples is at the forefront of developing one of the most dynamic and flourishing Jewish communities in southwest Florida. With its warm and inviting approach, Chabad is a place where people from all walks of life—regardless of background, affiliation or level of observance—feel welcome and at home. With the pride of success come the challenges of growth. Overflow crowds and burgeoning enrollments coupled with tight space and limited facilities have escalated the urgent need for more spacious and conducive quarters to serve as the central hub of Chabad activities. For seven years, Chabad Naples dreamed of the day it would build a major campus—buzzing with the laughter of children, the pursuit of knowledge and the spirit of community. Sunday January 15, 2012 was the day that dream came true with the Grand Opening of your New Chabad Naples Jewish Center. The doors are open, but the work is far from done. 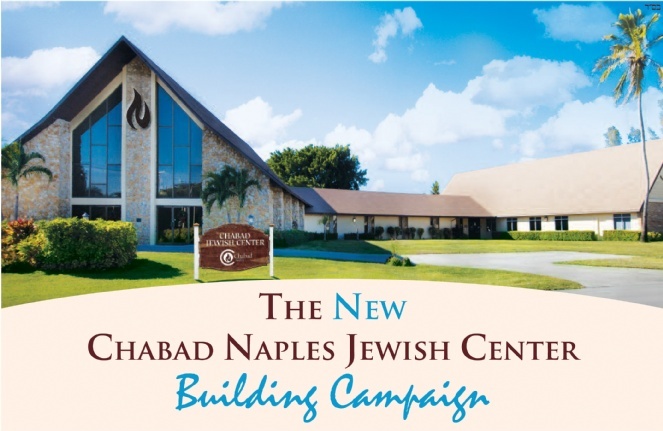 The campaign to enhance and grow the New Chabad Naples Jewish Center through the funding of many vital projects continues. Your participation in this Fund-a-Need campaign is critical to continuing what has only just begun. The fulfillment of this dream depends on people of initiative and compassion, of vision and generosity. CLICK TO SEE OUR CAMPUS MAP!